Turquoise swimming pools when seen from above shimmer like a squash blossom necklace on a jet setter’s tanned breast. Imported palm trees tower over a surrendering army of native saguaros, while skyscraper mirages of steel and glass gleam in the distance. This western metropolis pushes out more than up though, sprawling over 450 square miles. With the sixth largest population in the U.S., the Valley of the Sun attracts all kinds: retirees golfing their way into oblivion, snowbirds fleeing subzero winters, young construction workers cashing in on frenzied economic growth. Shopping malls, parking lots, concrete clover leafs, subdivisions, and apartments relentlessly eat away at the mesquite and ironwood at the rate of "an acre an hour." 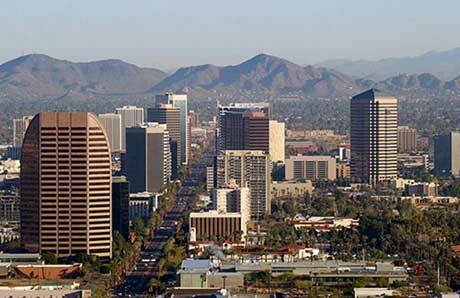 Skyline in Phoenix, Arizona, 2004. This view looks north along Central Avenue toward the Phoenix Mountains. Summer temperatures routinely soar over 100 degrees. Before air conditioning, the Sonoran Desert must have been unbearable. Where once rattlesnakes, scorpions, centipedes, tarantulas, and Gila monsters reigned over the sand, now gang wars, drug money, prostitution, Mafia murders and other urban amenities civilize the asphalt. In other words, an aura of the foreign and bizarre pervades Phoenix. What exactly attracted early settlers to this hard and uncompromising landscape. 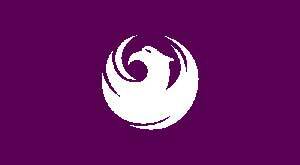 In a tome called Morals and Dogma of the Ancient and Accepted Scottish Rite of Freemasonry, 33rd-degree Mason Albert Pike states that the phoenix was a quintessential alchemical icon. In this regard J.E. Cirlot’s Dictionary of Symbols remarks: "In alchemy, [the phoenix] corresponds to the colour red, to the regeneration of universal life and to the successful completion of a process." Some Arizona prospectors may indeed have been seeking spiritual gold. Aztlan is furthermore conceptualized as an island, and some speculate that the name even refers to the legendary continent of Atlantis. According to comparative linguistics scholar Gene D. Matlock in The Last Atlantis Book, the Aztlán of Nahuatl mythology was really called Aztatlán, referring to the village of Nayarit on Mexico’s western coast. The Sanskrit word Asta apparently means "Place of the Setting Sun." Matlock suggests that this could actually be the westernmost boundary of what was once Atlantis. Did Lord Duppa and Judge Alsap consciously try to merge Egyptian and Mesoamerican mythologies in the wilds of Arizona? Alsap’s Bachelor of Law and Doctor of Medicine degrees prove that he was no dummy himself. 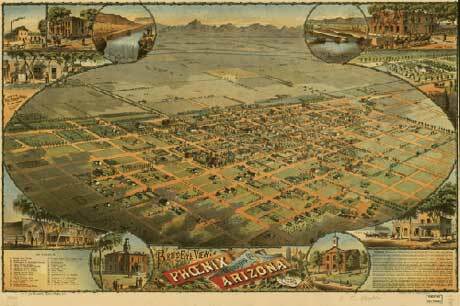 Was the establishment of Aztlan (Masonic Lodge No.1) and Phoenix (Masonic Lodge No. 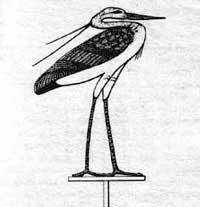 2) an attempt to symbolically merge Prescott (the heron) and Phoenix (the Bennu) in the same way they would soon actually be linked by stagecoach? Was it a clandestine Masonic intent that a new Atlantis (Aztlan) should rise in Arizona and a new Heliopolis (Phoenix) should be its heart? Whatever the reason, Columbus H. Gray, who served as a territorial senator and member of Maricopa County’s Board of Supervisors, began during Phoenix’s early years to construct a Masonic hall at the corner of Jefferson and First streets. Before it was completed, he sold it to Mike Goldwater, grandfather of Arizona Senator Barry Goldwater, himself a 33rd-degree Mason. Incidentally, Phoenix is located at 33 degrees north latitude. The Odd Fellows’ symbol of three links represents the principal tenants of Friendship, Love, and Truth, whereas Freemasonry’s square and compass signify Earth (matter) and Heaven (spirit) respectively. Further evidence of Duppa’s Masonic association comes from one source that connects him to Jacob Waltz, the famous Lost Dutchman, by identifying both men as Masons. 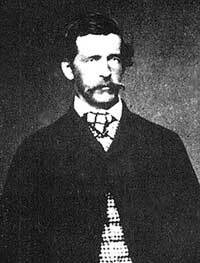 This German prospector supposedly discovered a fabulous gold mine in the Superstition Mountains east of Phoenix. As with many lost treasures of the Wild West, its location remains a mystery. 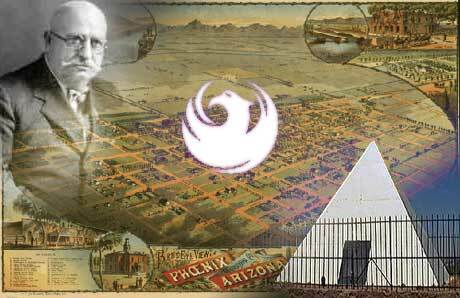 Masonic influence in Phoenix continued well into the twentieth century. 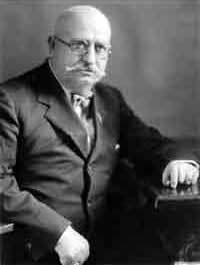 Arizona’s first governor, George Wiley Paul Hunt, served seven terms between 1912 (the year of statehood) and 1932. He was also a prominent and longstanding Freemason. As a populist and supporter of trade unions, he spoke and wrote in a simple and sometimes grammatically incorrect style. Nonetheless, like Duppa, he loved classical literature, which gained him the moniker "Old Roman." A man of contradictions, Hunt had also been known to address Theosophical Society meetings. His final resting place in Phoenix’s Papago Park is within sight of an archaeo-astronomical observatory once used by the Hohokam but now called Hole-in-the-Rock. 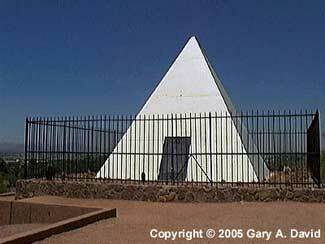 Oddly enough, Hunt’s family mausoleum was contructed in the style ;;of a white-tiled Egyptian pyramid. An even more insidious instance of power and wealth was Prescott Sheldon Bush (1895-1972). He was father of the forty-first U.S. president George Herbert Walker Bush and grandfather of the forty-third president George W. Bush. All three had been members of the notorious Skull and Bones Society, ;;an elite, quasi-Masonic fraternity at Yale University. Possibly the eldest Bush was named after his distant relative William Hickling Prescott, the historian noted above. 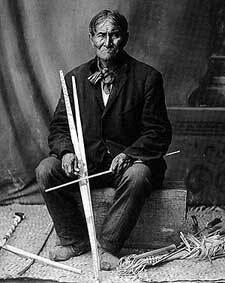 In 1918 Bush allegedly purloined the skull of the famous Arizona Apache warrior Geronimo from its resting place at Fort Sill, Oklahoma and took it back to the secret society’s meeting hall to be displayed in a glass case. The motive for this savage act is unclear, but it may have involved retribution for the 1869 killing of settler James G. Sheldon from Maine by Apaches at Camp Willow Grove west of Prescott. Sheldon, after whom a major street in Prescott was named, is perhaps a relative of Prescott Sheldon Bush, or he may merely be a namesake whom Bush was trying to avenge. Bush was later elected as a U.S. senator from Connecticut. His son and grandson, of course, each became president. The Bush vacation home is located in Kennebunkport, Maine. Geronimo’s skull has never been recovered. Gary A. David is an independent researcher and writer living in northern Arizona. The Orion Zone: Ancient Star Cities of the American Southwest will be published by Adventures Unlimited Press in November of 2006. (See http://www.theorionzone.com/ .) This book discusses a correlation between the stars of Orion and the Hopi villages and ruins in the Four Corners region of the US. Recently Mr. David’s articles have appeared in Atlantis Rising and World Explorer magazines.